Depending on which article you read, and what your own personal definition of various sub-genres may be, Tactics fit into the realm of post-punk, art rock, and/or new wave. The band formed in the late 70s as an answer to the growing presence of these styles of music in Europe and the US, but somewhat of a lack of it down under. Tactics certainly gave Australia a definitive sound so far as that’s concerned. They’re my latest craze, having snagged a few LPs off Discogs over the past couple weeks. Newly added include Blue & White Future Whale from 1986 and Holden Interview from 1988. These two round out the band’s tenure, which ended with 1990’s The Great Gusto. I’m now on the hunt for their debut LP, My Houdini, from 1980. So, as you’re probably unfamiliar with this band, let’s dig into it a little. My introduction to the band did not come at the beginning. In fact, it came toward the end with Holden Interview and the song “Committee of Love”. It was the rapid-fire guitar melody that initially drew me in (somewhat reminiscent to me, at the time, of early stuff by The Feelies), with David Studdert’s signature vocal styling sealing the deal. Studdert was the band’s lone mainstay, as over their decade-long existence they went through several lineup changes. But their overall sound remained quite steady. Compare “Committee of Love” to some of the tracks off My Houdini and you’ll hear a sound quite similar. Then again, the unique qualities of Studdert’s vocal styling really cements the fact that it’s most definitely the same band. Holden Interview is technically dubbed a mini album and can possibly even be called an EP given its shorter duration and inclusion of just seven songs. While “Committee of Love” boasts the catchiest melody on the album, there’s plenty of greatness to be found here. Case in point: “Hole in My Life”. I was lucky enough to find both Holden Interview and Blue & White Future Whale in the same batch of records by a US-based seller. 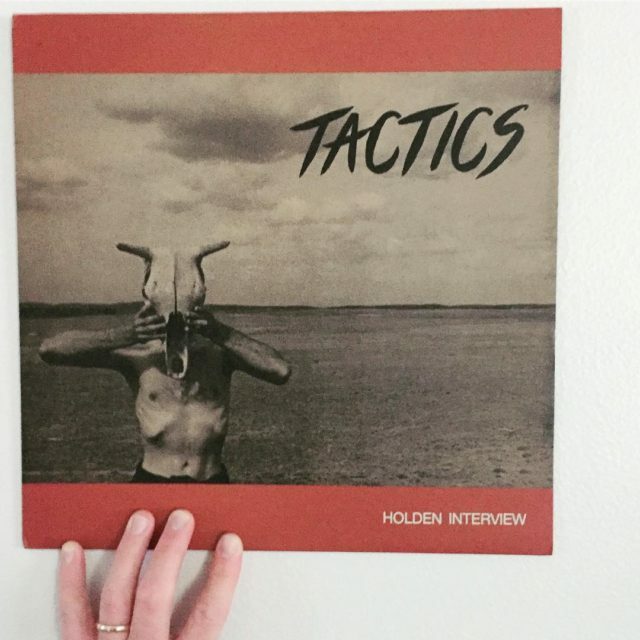 Most copies of Tactics LPs are either in the band’s home country of Australia or in the UK, where the majority were released. Studdert has been quoted as striving to create an “identifiable sound” with Tactics and he certainly achieved it, with punchy staccato guitars and a vocal styling somewhere between a less awkward and more subdued David Byrne (Talking Heads) on the low end and a more skillful Alec Ounsworth (who would debut 25 years later with Clap Your Hands Say Yeah) in the higher pitched moments. “Body In A Field” (above) and “Absolutely” (below) are two additional standouts off Blue & White Future Whale. Finally, we go back to the beginning. There’s no question; My Houdini finds Tactics at their most post-punk. “Second Language” has a melody both angular and intriguing; it’s catchy, punchy and effortlessly draws you in. This continues throughout My Houdini on songs like “New York Reel”. Despite what I said earlier about Tactics maintaining a consistent sound, that’s only part of the story. Studdert was able to create something completely unique to Tactics, but each album was definitively unique to itself. My Houdini (1980) was a bit more raw and edgy with more post-punk sensibilities. Glebe (1981), if you dig into it a bit, is surprisingly mellow compared to the album that came just one year prior. Blue & White Future Whale (1986) had a deeper underlying darkness to it with fuller production. Holden Interview (1988) was a re-recording of several songs that were previously released as singles, so it jumps around a little. But despite all of this, there’s no questions who’s behind these releases: Tactics, one of the greatest Australian bands of the 1970s and 1980s.